I sat down last weekend to write a draft for a new Kids on the Cusp post. I couldn’t get started. I couldn’t pick a topic. It wasn’t writer’s block. There were just too many topics swirling around in my head. I decided to walk away for a moment and finally sort through my summer pool bag, still sitting in the corner filled with magazines and articles I’d planned to read (but never actually did) this summer. The NYTM cover read, Building a Better Teacher. The subtitle asked, “Can Educators Be Educated About How to Educate?” Written by Elizabeth Green, it poses a complicated question, as evidenced by the 8,000 words Green devotes to exploring possible answers (with a strong focus on the ideas of educator Doug Lemov, author of the Teach Like a Champion books). I decided there was no time like the present to read it. Reading it gave me a valid excuse to put off the ridiculous amount of school-related paperwork staring at me from a different corner of the living room. So what can we learn about teacher-building? The cover of the magazine introduces a dark-haired teacher, poised superhero-style, glancing sideways, alert and ready for action. In her right hand is a piece of “Smart Chalk,” guaranteeing that she “Never write a wrong answer.” In her left hand is a coffee mug filled with instant “Command of Authority” (and I hope, for her sake, some actual coffee). Her intense eyes gaze through her “Behavior-Monitoring Glasses.” She looks prepared and ready for anything. Sometimes I feel like this woman, prepared and ready for whatever enters the classroom on any given day. Like her, I wear reading glasses, but the view from behind my lenses doesn’t resemble the image on page 30 of the magazine. In the magazine not a single student in the picture is smiling. Not a single student is truly engaged. It is not a pretty picture of a “typical classroom.” It is not the picture I see each day walking in and out of the classrooms of my friends and colleagues. The view from behind my glasses, as a matter of fact, is drastically different. I witness many moments of uncaptured magic, and these moments inspire me. Green asks, “Can Educators Be Educated About How to Educate?” Yes, they can. And we can do it for ourselves. I know this for a fact. I learn more each day about how to be a better teacher by watching other teachers in my school. I hone my own teaching skills from observing other skilled educators cope with the crazy stuff, inspire the kids, and teach in new and different ways. I observe them being dragged down and disheartened too, mostly by administrative demands that eat away the time we have to do the important part of our job…the actual teaching. When one of my students asks a “thick question” like the one mentioned in Green’s article, I encourage them to do a little research into the topic. So, I thought, maybe this article will give me some insight (and possibly a topic to write about). I needed to practice what I preach…or more precisely, practice what I teach. The article, quite frankly, added even more topics to the swirling frenzy in my head, but it got me thinking. It got me thinking about teacher training. “Building a Better Teacher” was not only a lesson in the history of teacher training practices, it also gave me much pause for thought as it tried to define what makes a good teacher. I ask myself that question on a daily basis. The teaching theory and academic aspects of teaching offered in grad school were quite helpful in my quest to become a good teacher. But it is the time INSIDE the classroom that has taught me the most. That’s the laboratory where I conduct my experiments, where I really find out what works (and what doesn’t) for me personally, and, as an extension, what works for my students. Great teachers come in all shapes and sizes. Green’s article, aside from giving me knowledge about the circumstances, politics, and pendulum swings in education as well as the statistical models for evaluating teacher success, helped me understand that I am, in fact, a darned good teacher. Her article also made me realize that I know very little about the history of teacher training and how policies are made. And how ill-informed I am about the politics that are deconstructing the art of teaching. One of the building blocks discussed in Green’s article was the use of video as a tool for professional development. Videotaping real teachers in the real world is an opportunity to take an anthropological look at the teacher in his or her natural habitat. It’s laboratory observation. It’s helpful. It’s valid. It’s inspiring. It’s humbling. I’ve been videotaped a few times. It was truly uncomfortable the first time. It was part of a distance-learning course in grad school, and it was the first time I had the chance to observe myself as a teacher. I still cringe when I think about how many times I stuttered, “Um,” in that video. 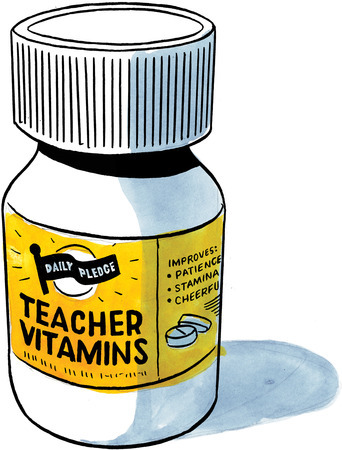 Yet the benefits of teachers learning from each other, from seeing each other in action, whether we are armed with “Instant Command of Authority,” “Smart Chalk,” or donning our magical “Behavior-Monitoring Glasses,” seem obvious. I wish we could start using more of this anthropological approach to professional development in my district. Instead, we are often required to attend large-group, lecture-based professional development sessions twice a year. Left to my own devices, I would spend my “professional development hours” observing other teachers in action, watching Teacher Channel videos, reading articles about new and exciting ways to improve my teaching, spreading out files and individual student data (in an empty, quiet classroom or on my living room rug) in an effort to identify my current classes’ individual needs and to plan small group instruction. At home, I am often left to my own devices, and they are spread out each weekend on my living room floor. I AM learning and growing as an educator. I AM making an effort to research and incorporate teaching practices that affect our current system of education. This particular type of professional development doesn’t count toward our state requirements for twenty hours of PD each year, though. That’s a shame. These are amazing, talented, earnest teachers who, like myself, are not being built up by the current system. The big business of education, the mountains of not-so-useful paperwork that are growing exponentially in New Jersey, and the lack of meaningful professional development are not helping me become a better teacher. They are tearing down my ability to do a job I love. The obsessive focus on “what’s wrong” is eroding the spirit of many of the teachers in my world, breaking them down, not building them up or making them stronger educators. Attending mandatory workshops and completing piles of paperwork do not build a better teacher. They have the exact opposite effect on the teachers I see hustling through the halls during the daily, 30 to 45 minute prep period allotted to each of them. Thankfully, I also found a desperately needed a can of “Do the Best You Can, Mary” at the bottom of my pool bag. I’m going to take it to our next required in-service day. I’ll try to go in with an open mind…and a can opener. Sadly, the words you write are right on target here in Florida as well. We have so much “stuff” to do I cannot prep for my daily lessons unless it is on my own time. It is sad, JoAnn…I really do enjoy planning lessons at home, where it’s quiet and away from the clatter of a school, but it sure does take a chunk out of my week nights and weekends!..When I close that classroom door though, all the other outside crazy goes away for a while.